A schtick to sink your teeth into. Generation after generation. BEAVERS. Sharing the same land, the same lake, and the same nightmare depicting commercial development threatening their corner of paradise in the Laurentians, Quebec. Get wet at the best dam show! 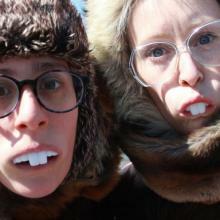 In this wonderful bilingual production, Maggie Winston and Rae-Anna Maitland present the conflict between beavers and cottagers on a lake in the Laurentians from the point of view of the beavers. It is a consistently surprising and delightful production, full of imagination, creativity and humour. The story—based on the experiences of Winston’s family (some of whom are heard in recorded interviews)—is acted out by Winston and Maitland in beaver suits. Using puppets, shadows and simple props, they convey the events with surprising effectiveness. Somehow they make their choice to use their fingers to represent the humans scurrying about as they try to combat the effects of the dam on the level of the lake seem both inevitable and perfect. We get a glimpse into the domestic life of beavers (apparently their young enjoy bedtime stories), the horrors of clear cutting and the beavers’ sensual obsession with wood. The story of the cyclical contest in which the humans destroy and the beavers rebuild the dam is engaging, but the wonder of the show comes from the imaginative production. It’s a show that makes you ask “Who ever thought this could work?” even as Winston and Maitland amaze you with how well it does. The Fringe Festival is a place where we seek ingenuity, creativity and imagination. We want to be surprised and delighted by the unexpected. We want to see theatre that we could not find elsewhere. Beaver Dreams (La Fièvre du Castor) delivers all of that and more. It is astonishingly good. Seems we all want the same things, whether we’re humans or beavers: a good life, in a beautiful place. In Beaver Dreams, both species share the same lake, the same trees… and the same nightmare. Put simply: development. But this means different things for our two subjects. We watch both in English and French – the beavers through the playful antics of performers Rae-Anna Maitland and Maggie Winston, aided by puppets of all kinds and some very clever props (watch out for the bees! ); the human owners of a remote cottage are captured in similar ways, along with a lovely animation. The show has an important, and thought-provoking message, but it’s delivered subtly, amongst a whole lot of charming silliness and playfulness. Maitland and Winston give us a beaver’s eye view, and share their story with the unbridled and infectious joy of two kids playing make-believe. This show is a delight for ten-year-olds of all ages, and their outer adults. Beavers: they’re just like us. And these two are wonderful to spend an hour with. The actual translation of the show’s French title is Beaver Fever — and it’s certainly well worth catching! Hi, I am one of the narrators of this terrific show. I just want to correct one comment. We have been there since 1935. The beavers didn’t show up until about 1960, so humans are aboriginal to the place. And no matter how often we tear down the dam to keep the lake level reasonable, they have it built up in the Fall to provide for themselves in winter, which is its purpose. So they win every time! Reasonably peaceful co-existence you might say! Beaver Fever! AN ALL- AGES SHOW! I saw this production last night and I have to say BRAVO to the performers, Maggie Winston and Rae-Anna Maitland. All has been said by the previous reviewers about the engaging way they tell the story about the conflict of man against nature with their inventive puppetry, set, lighting, costumes, including two great sets of beaver-sized choppers. They just might change your mind about beavers. And if you are wondering which shows are appropriate for your children or your grandma, this is the one! A thoroughly engaging and entertaining show for all ages. Just two more shows: Thursday June 7 at 7:00 and Friday June 8 at 5 at the McManus.